It's a special day in our family! We plan to spend much of this weekend celebrating. Today, Teagan is 7 years old. I've shared her 4th, 5th and 6th birthdays on the blog. This year, Teagan has been really interested in learning more about when she was a baby and when she was born and stories from my pregnancy. For many week before Teagan was born, Mommy and Daddy would enjoy some time together watching a TV show called "Jeopardy." We watched it every night at 7:30 and enjoyed trying to guess the answers before the players did. On the day Teagan was born, we had gone to the hospital just after lunch time. The doctors and nurses didn't think Teagan would be born until much later at night, but Mommy and Daddy knew better. We told Teagan, in my belly, that she needed to be born before Jeopardy came on. She was born at 7:29. I started having cramping and possible contractions on Tuesday at lunchtime. Went home early from work. Christy came over and we went out walking the neighborhood for over an hour. The pains stopped and I was exhausted. I had hoped that the walking would bring on labor but it didn't seem to work. Woke up Weds morning at 6 to get ready for work. Cramping like crazy and feeling really odd. Called in and started to really look forward to that afternoon's doctor visit because I had high hopes for some good news about progression towards labor. Jeff headed off to work. Around 9, I noticed that the cramps were becoming more intense and more regular. And more all over my stomach. Around 10, I called Jeff and told him he might want to be home within the next hour because this could be it. Called the doctor's office and told them what was going on and asked if I could come in earlier than my 2:15 appt. They asked some questions and told me to come in right away. I called Jeff back and told him to come home right away- we needed to get to the doctor's office. Jeff got home, we took off. These are feeling more and more like contractions but I'm still not convinced that this is the day. We see Dr. Payne and he checks me- I'm dialated to 4 and am 90% effaced- time to head to the hospital! We get to the hospital around noon. I actually had to sit through admitting while having contractions. We complained about that- not a big deal but it was annoying. When we had our false start on Sunday, they took me to a room right away and Jeff handled admitting for me. Anyway, they got us into Labor and Delivery Room 9. The contractions are definitely regular and more intense and I can no longer deny what is happening. The pain is pretty managable and Jeff is doing a great job coaching me though them. At 1:30, Dr. Wright checks me and determines that we should break my water. They do and there is a lot of meconium- so the NICU is alerted to be ready when we deliver as she will need extra suctioning attention to remove the meconium from her body. Once my water was broken, the contractions were beyond intense. It was a pain that I cannot put into words. I became very gutteral and withdrawn during the contractions. I would still respond to Jeff's coaching to breath and relax but was groaning out each breath. The neatest thing was the immense feeling of relaxation that occured between each contraction- that let down feeling was incredible. However, the contractions weren't worth that feeling! They got so bad that I was crying and on the verge of not being able to focus and when offered an epidural, I took it. I feel like it was the best decision I made. Relief was almost immediate and I was then exhausted from the 3 hours of hard contractions (2 after the water breaking) and was able to sleep off and on. We got the epidural around 3:00. Jeff was so wonderful during that epidural. They were adjusting my bed to do the procedure and needed me to sit up. When I started to sit up, a contraction came on. Jeff had been helping me sit up and when the contraction started, I couldn't move forward or backward because the pain was unreal. My husband stood there, braced himself, and kept me in my position with one hand until the contraction was over. He was a hero! During the epidural, he stayed with me and kept his face over mine so I wouldn't raise my head and so that I would feel comforted- which I did. He was everything I needed and more. Anything I asked for- lip balm, ice chips, etc- he was on it. Frequently, I didn't even have to ask as he would just offer. At 4:30, I was checked and had dialated to a 5. The nurse thought we would probably deliver around 11 or 12 that night. Around 5:30, our nurse determined that there was something wrong with my contraction monitor. We'd been having trouble with it the whole time- it didn't want to register my contractions. So, she had called Dr Wright to see if we should use an internal monitor. He came to do the monitor at 6:00. He checks me first and it turns out that in an hour and a half I had gone from a 5 to a 10 and was ready to push! The epidural had spread evenly throughout my lower half and then, because of how I was propped up, I began to feel contractions on my left side. They didn't hurt but I was aware of when a contraction would start. When it was time to start pushing, I was no longer tilting to one side- I was evened out. And I had no sensation in my right leg! The nurse stayed on my right and Jeff stayed on my left. Since the monitor wasn't working, my job was to tell the nurse when I felt a contraction. She would hold up one leg and Jeff was instructed on how to hold the other while still giving me his hand to hold when I pushed. I was coached to push from my gut- like doing crunches. I pushed for an hour and 10 minutes. A second nurse joined us around 7- shift change- but our first nurse still stayed with us to finish the job! After that hour and 10, the doctor was called in- and told he had better hurry because I could have the baby at any second. I was actually told to not push for the next couple of contractions! Dr Wright arrived, I did a few sets of 3 pushes. I could feel her coming and on the last push, I did the 3 and they asked if I could go four- but I was already going for 4! Her head came out and I began to cry. I couldn't even put into words everything I was feeling. I pushed again when instructed and our beautiful baby girl was born. She was placed on my stomach for initial suctioning and cord cutting. I couldn't see all of her- but did see her right shoulder and arm. She shot her little hand straight up in the air and I put my finger in her palm and she grabbed on so tight! Then she was taken to the warmer so the NICU team could get her cleaned out. Just hearing her cry made me cry more. I told Jeff that I was fine and that he could go and be with her and he went and held her hand and got to meet his baby girl for the first time. I was bleeding very heavily and extra measures were taken to stop the bleeding. Teagan was eventually suctioned out and we got the news that she wouldn't have to stay in the NICU nursery. Once I was done being stitched (episiotomy) and my bleeding was under control, Teagan was brought to me. I was so overjoyed. She was (and is) absolutely perfect in every way! Thank you for sharing. Teagan is a very special person, just like her mommy! I enjoy birth stories. Thanks for sharing yours! 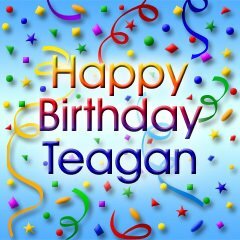 Happy Birthday, Teagan. Never miss a post! E-mail Updates! The Ones You Really Liked! Did You Not Get the Memo? See's Candies: Worth Cheating For!